JNN 06 Sept 2014 Rotterdam : Bringing nearly 10 thousand pro-Gaza protesters to the streets, a recently formed Islamic party has appeared as a new political force in Netherlands, with a new ambition to grow in the national politics. “During the second world war, the city of Rotterdam was occupied by German forces and bombarded repeatedly until it was fully destroyed. 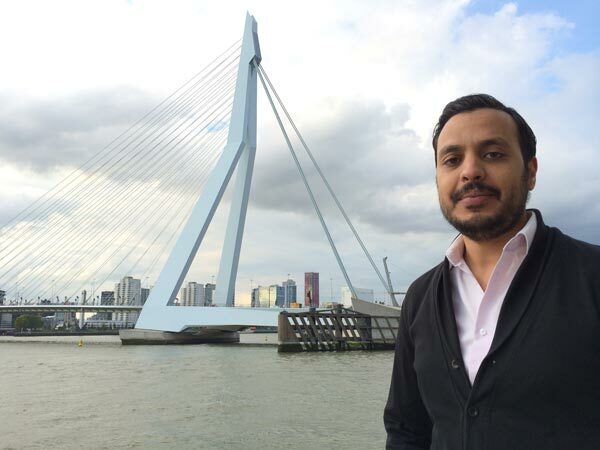 From a historical perspective, we can relate to what the people in Gaza are going through,” Nourdin el Ouali, member of the city council in Rotterdam, told OnIslam.net in an exclusive interview. NIDA, his political party, was the main organizer behind the largest pro-Gaza demonstration in the Netherlands which drew some 10 thousand protesters to the street. The protest against Israeli aggression on Gaza saw the first major appearance for the relatively new political party in the Netherlands which won two out of the 45 seats in city council during this year’s election. Gaining support from Muslim and non-Muslims as well, NIDA-led protest gave a powerful support to the Gazans case against injustice and international negligence. “When we organized the pro-Gaza demonstrations earlier this month, we were able to draw a crowd exceeding ten thousand people, and not just Muslims,” el Ouali said. For almost two months, Israel launched relentless airstrikes against Gaza where more than 2,100 have been killed and thousands injured before announcing a ceasefire last August 26. According to UN Office for the Co-ordination of Humanitarian Affairs (OCHA), about 80% of deaths in Gaza are civilians, including dozens of children and women. The large scale of mass destruction in Gaza has left about 5,510 homes completely destroyed and about 31,000 partially damaged, forcing tens of thousands to flee their homes that were caught up in the Israeli air strikes. The war sparked huge protests across the world, with protesters staging protests from Jakarta, Indonesia to Berlin, Germany in condemnation of Israel’s offensive on Gaza. The fact that el Ouali is part of local politics doesn’t withhold him from addressing international topics. “The city of Rotterdam is home to people with over 170 different nationalities. Everything that happens all over the world is connected to people that live here. The people who voted for us care greatly about the Palestinian cause,” he told OnIslam.net. But there is also a strong personal motivation to support Gaza. “I was part of the flotilla that attempted to reach Gaza in 2011. I have always felt connected to the Palestinian cause. I remember watching my mother cry in front of the television when I was just a six year old boy. The party leader revealed plans to accept Gaza as a sister-city of Rotterdam. “NIDA is right now working on a proposal to accept Gaza as a sister-city of Rotterdam, like many other cities are. This would mean we commit ourselves to supporting the rebuild of Gaza for the upcoming years,” el Ouali said. The pro-Gaza protests also mark a transition in the presence of Muslims in the Netherlands and how they can be viewed. “We don’t call ourselves a Islamic political party, because we don’t want to limit our target audience to only Muslims. We aim to serve all people in Rotterdam, based on the inspiration we take from the Qur’an,” el Ouali explained. “When we are able to mobilize so many people, it shows we are no longer a group that can simply be ignored. We are now well organized and able to deliver a peaceful and strong response to the injustice we witness in the world around us,” el Ouali said. “The people that voted us in have seen a huge gap between the political discourse and the actual reality within our society. While politicians still treat Muslims or ethnic minorities as second class citizens which still need to prove they are part of this society, in reality Muslims are already fully part of the multicultural and very diverse population which has been shaping the society we live in for years. This entry was posted in Europe and tagged Dutch Islamic Party, Europe, NIDA, Pro Gaza Protest, Rotterdam. Bookmark the permalink.